Despite the package tour, Concorde and villas in Spain, holidaytime is summed up in those magnificent seaside resorts that form a magic necklace around our coasts. Most were built or developed when the railways came, in the Victorian age of opulence, unaccustomed mobility, and public festivals. And almost every resort was punctuated with its winter gardens, pier, ballroom or palace of varieties. Here are the marine extravaganzas, the piers and pavilions, the alhambra, hippodrome and kursaal entertainment centres - often combining theatre, circus ring, ballroom, winter garden, aquarium and sideshows under one roof. Here too are the theatres, music halls and concerts and opera houses, with their rich interiors and their wealthy backers. Here are the glass domes, the crystal palaces, and the extraordinary skating rinks, observation towers and endless tripper distractions. Cinema came to the seaside too, and simulated custom-made buildings. Behind these funhouses for the newly travelled classes were money men, architects and developers - men of vision and purpose. Yet they did not always succeed in translating their dreamlands into reality - Dreamland on sea was never built, but the concept was breathtaking. 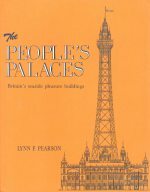 The resorts remain; so do some of the people's palaces. The 'seaside style' had come, and some would say, has gone. There is still a significant pull to the seaside, which is part of our heritage. Our resorts have a future, and their palaces are part of it. This is the record of the places, the buildings and the people behind them, in a fascinating and fluent narrative, extensively illustrated, and appealing to the armchair traveller, those of us who cherish our coastal heritage, residents of our resorts and the seasider in all of us. The main resorts covered are Blackpool, Brighton, Douglas IoM, Great Yarmouth, Morecambe and Southport, together with Bournemouth, Llandudno, New Brighton, Scarborough, Southend, Southsea, South Shields, Torquay and Whitley Bay. Also included are Aberystwyth, Bexhill, Bognor Regis, Bridlington, Clacton, Cleethorpes, Colwyn Bay, Cromer, Dover, Eastbourne, Felixstowe, Fleetwood, Folkestone, Harwich, Hastings, Herne Bay, Hunstanton, Ilfracombe, Lowestoft, Lytham St Annes, Paignton, Plymouth, Ramsgate, Rhyl, Ryde IoW, St Leonards, Sandown IoW, Shanklin IoW, Skegness, Southampton, Teignmouth, Tynemouth, Westcliff on Sea, Weston-super-Mare, Weymouth and Worthing.